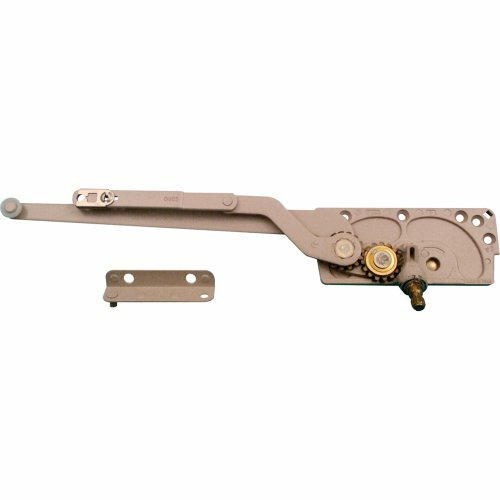 This bi-fold door repair kit includes replacement parts to repair one 2-panel set of hinged bi-folding doors. The plastic bases of the pivots and guide measure 3/8 inches in outside diameter, and the guide features a 7/8 in. outside diameter plastic wheel. A steel bottom pivot bracket and door aligner are also included, together with a wooden knob that can be finished in stain or paint. The snugger has a white plastic body with a steel spring, and the fasteners for all components are included with each package. Hinges are not included with this kit. 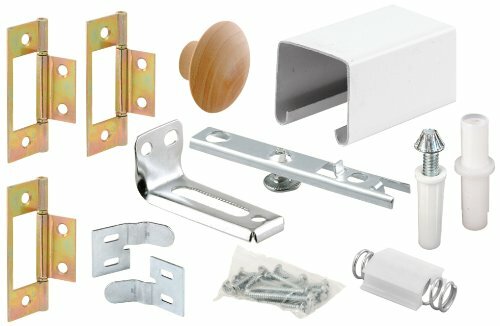 These components are used by many bi-folding closet door manufacturers. *Tip: In a typical bi-folding closet opening, a pair of bi-folding doors is hung on the left side of the opening and a second pair of bi-folding doors is hung on the right side of the opening (a total of 4 narrow doors hung in left and right pairs). The contents of this kit provides for the repair of only one of those pairs, or for 2 of the 4 doors that are hung in a single opening. When your pocket door privacy lock is broken or old, don’t replace the door entirely, just get a lock and pull! This deluxe pocket door privacy lock and pull has a wide, easy grip design and is for left or right-handed doors (see video for instructions on how to reverse handing). It also includes all the hardware needed for quick and easy installation. This pocket door pull and lock is constructed from solid brass, so it’s durable, strong and sure to last the test of time. 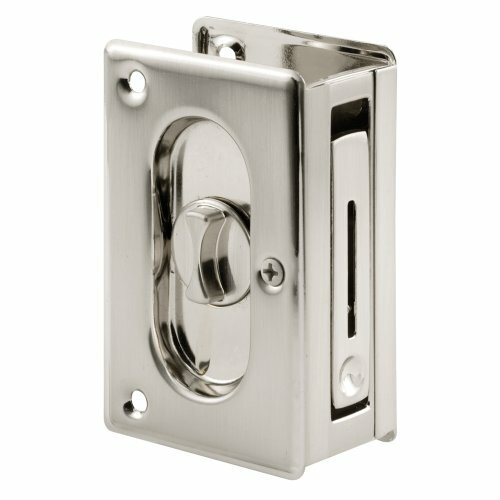 This lock adjusts to install on both 1-3/8” and 1-3/4” thick doors and is a mortise installation. This bi-fold door track kit is designed for a two door installation. It features a 36 in. long track and includes all necessary hardware. This kit is for use on doors weighing up to 20 lbs. each. Bi-Fold Door Top Pivot and Guide. 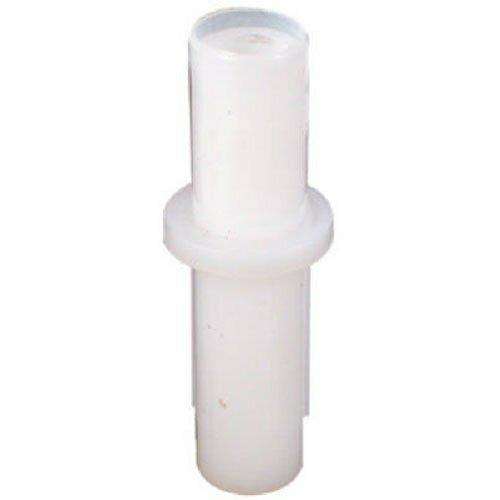 Solid 3/8" plastic tip guide and pivot; 3/8" diameter base. 1 5/8" overall length. Whether you’re fixing your new dresser drawer that keeps getting stuck or restoring Grandma’s beautiful vintage hutch, these R 7321 Drawer Track Guide and Glides are must-have. 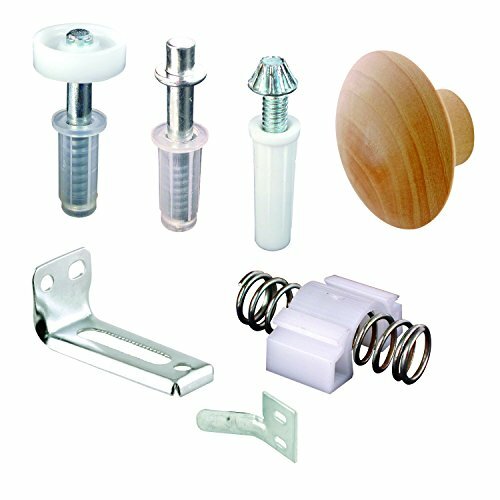 These furniture replacement parts can be used on a variety of furniture drawer systems, including dressers, hutches and night stand drawers. They’re quick and easy to install and can save a broken drawer. 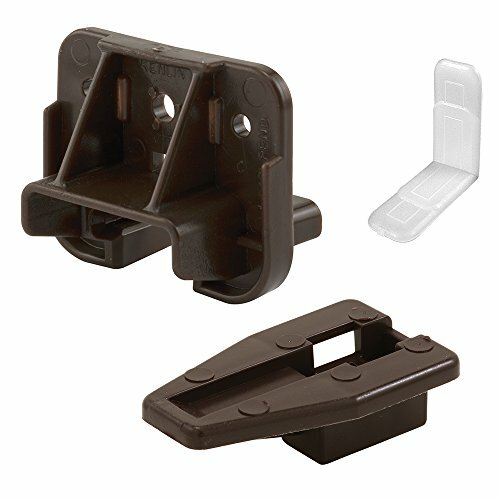 Made of brown plastic, these R 7321 drawer track guides can fit the Kenlin Rite Trak 1 system. When your favorite dresser or furniture has a broken drawer, don’t toss it, fix it! With quick and easy installation and an inexpensive price tag, you’ll be thrilled with the results. Each kit includes 2 dark-brown, plastic track case guides and 2 track guides, 4 white, plastic corner glides, 8 ring shank nails for nailing in corner glides (3/4" x 14-1/2 ga.), and 8 Phillips drive, pan head screws for installation of guides (#6 x 5/8"). Please note, a metal track is required with these guides, but is not included. 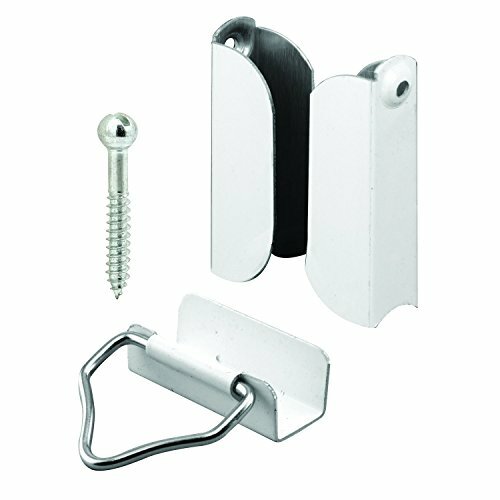 These hangers and latches are constructed from stamped aluminum and come finished in white. They include 4 top hangers and 2 bottom latches. 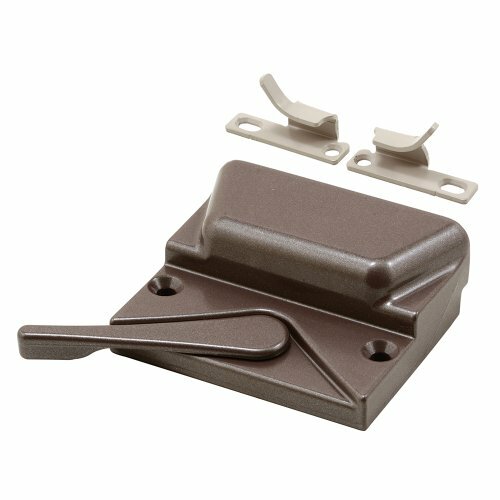 These types of hangers and latches are used to attach screen frames to wood window frames. This steel constructed bracket is for use on top tracks with a width of 5/8 In. Comes complete with retainer screw and features a 3/8 In. diameter pivot hole. Fits Acme and similar styled doors. 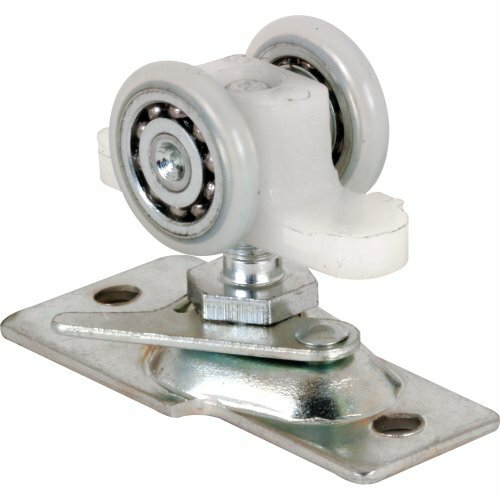 This pocket door roller assembly is constructed of a steel bracket and ball bearings with plastic tires. The bracket’s hole center spacing measures 1-7/8 in. and it features 2 parallel wheels that are spaced apart at 3/4 in. on center. The wheels are constructed of durable plastic which provide for a smooth, long-lasting, quiet operation, and they feature 13/16 in. diameter convex (round) edges. These adjustable roller assemblies mount on the tops of pocket doors, and they are used by Kenna-frame, Crawford, Press-Rite Doors, and many other pocket door manufacturers. These roller assemblies have a 100 lb. max. capacity. This roller assmbly fits into a 1 in. wide track (inside dimension, wall-2-wall).